Taste test: These are wide-rippled chips with a really excellent cream and onion flavoring. The flavoring isn't too strong, as it is with some sour cream and onion chips that really pack on the flavor, but it's definitely not weak either. The onion is sweet but sharp, the cream flavor is smooth, and bottom line is that the chips are very, very tasty. 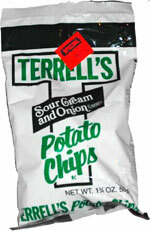 To add to the great flavor, Terrell's packed whole a lot of chips into this 50 cent bag. It's probably enough chips for both lunch and a midafternoon snack. Smell test: None that I could notice.